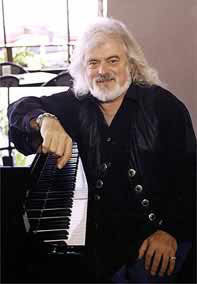 From 1966 until his departure for America in 1975, singer, songwriter, keyboard player and producer Brian Cadd was one of the most prominent musicians on the local scene. He remains a key figure in the history of Australian popular music; one glance at his extensive discography will demonstrate his prolific musical output as writer, performer and producer, and he has also been active behind the scenes in many areas of the industry throughout his long and successful career. Brian was born 1946 and raised in Perth, W.A. At the age of ten, his parents gave him the choice between tennis lessons or piano lessons -- obviously he chose the latter. At twelve he entered a TV talent quest, from which he was offered the job as pianist in a junior band on a local children's TV show. After that, Brian worked in his cousin's club band, and in a pop group formed with school friends. After leaving W.A in the early '60s the Cadd family moved to Tasmania and eventually settled in Melbourne, just as Beatlemania swept the country. This, combined with Brian's interest in piano, opened the way to his future career. Brian's earliest musical ventures in Melbourne were the Beale Street Jazz Band and The Castaways. In 1965, The Castaways mutated into the R&B band The Jackson Kings consisting of Brian, Carl Bennett (vocals), Chas Brown (guitar), Ray Neville (bass) and Bill Turgeon (drums). Singer Ronnie Charles joined towards the end of the band's life. The Jackson Kings recorded two singles for CBS, "Watch Your Step" / "Come On Now" (Feb. 1966) and "Watermelon Man" / "Lawdy Miss Clawdy" (April 1966). From The Jackson Kings, Brian went on to two of the most celebrated bands of their day, The Groop and Axiom. The careers of both these outstanding groups are covered in detail on the dedicated pages on Milesago. Besides writing or co-writing The Groop's original material, Brian also began getting his songs covered by other artists. No doubt via the Meldrum connection (Ian and Ronnie were childhood friends) Brian wrote and produced Ronnie Burns' 1967 single "When I Was Only Six Years Old", which was later covered in the UK by former Manfred Mann vocalist Paul Jones with some success. Brian also wrote the late '67 hit "Elevator Driver" for The Master's Apprentices. At that time the Masters' career had been thrown into disarray by the sudden and unexpected departure of songwriter Mick Bower. As an interim measure they covered one of Brian's songs, "Silver People", which they rearranged, retitled and issued as the follow-up single to their national hit "Living In A Child's Dream", and this provided them with a vital "stopgap" hit while the Masters regrouped. In 1969, near the end of their career, The Groop also contributed (uncredited) to the backing tracks for Russell Morris' first two solo Singles, the phenomenally successful "The Real Thing" and its follow-up "Part III Into Paper Walls". When The Groop split suddenly in late 1969 (to the consternation of many) Brian went straight on to his next project. Brian and Don had formed a strong writing partnegsubip and after the demise of The Groop they put together what is generally considered Australia's first supergroup, Axiom. The rest of the all-star line-up consisted of former Twilights lead singer Glenn Shorrock, Valentines drummer Doug Lavery (later replaced by Don Lebler) and Cam-Pact singer-guitarist Chris Stockley. Much of their work exhibited the influence of The Band, whose first two albums had cast their spell on so many musicians, including George Harrison and Eric Clapton. Don and Brian co-wrote all their original material, including the hit singles "Arkansas Grass", "A Little Ray of Sunshine" and "My Baby's Gone", and the band recorded two very fine LPs, Fool's Gold (Fable, 1969) and If Only (Warner-Reprise, 1971), the latter recorded in Los Angeles and produced by the legendary Shel Talmy. After the break-up of Axiom in March 1971, Brian and Don returned to Australia but they continued working together. Brian's return marked the start of a whirlwind of recording, writing and production and touring. He also worked behind the scenes in the music business, getting into publishing and management. He co-owned a booking agency and became the youngest ever Director on the Board of APRA, the Australian Performing Rights Society. One of Brian's first major projects on his return to Australia was with for his old mate Russell Morris. Russell and Brian had known each other since the mid-60s -- Russell's band Somebody's Image got their first break supporting The Groop. Russell had been working on a solo album with EMI house producer Howard Gable, which had been scrapped because of differences between Russell and Howard over the direction of the music. Brian was (pardon the pun) instrumental in helping Russell to get the faltering project back on the rails and his contribution cannot be underestimated. He assembled the crack team of musicians who realised Russell's splendid batch of new songs for the album. This studio lineup comprised a "who's who" of OzRock heavyweights -- Barry Sullivan, Barry Harvey, Phil Manning and Matt Taylor (Chain), Mark Kennedy (Spectrum), Duncan McGuire and Billy Green (Doug Parkinson In Focus), Brian Holloway, , Peter Jones, Marcie Jones, Zoot's Beeb Birtles and Rick Springfield, and of course, Brian himself on keyboards and backing vocals. Issued in late 1971, the recordings were a major commercial and critical success -- and a validation of Brian and Russell's faith in the music. The single "Sweet Sweet Love" reached #7 and the album, Bloodstone made #12, as well as earning considerable praise from critics. Brian began to establish his solo presence when he and Don Mudie issued the duo single "Show Me the Way", released on Ron Tudor's Fable Records in December 1971. It was a very respectable success, reaching #17 in February 1972 and charting for 12 weeks. By this time, Brian had become Fable's A&R manager and chief producer, and in this capacity went on to write, play on and produce Robin Jolley's 1972 hit "Magsuball's Portable Music Machine" (a virtual Cadd solo single in all but name and lead vocal) and Robin's subsequent solo album. Brian also produced the Hans Poulsen second solo album Lost and Found - Coming Home the Wrong Way Round (1972), the album 1972 BC for Frieze (Beeb Birtles and Daryl Cotton) and he produced and/or contributed to albums and singles for Stephen Foster, Fat Mamma, The Strangers, New Dream, Dutch Tilders, Bluestone, Kerrie Biddell and Daryl Somers. Brian's first fully solo recordings were "Sure Feels Good", "Making It on Your Own' and "Come With Me" which appeared on the soundtrack album of Albie Falzon's classic surf film Morning of the Earth (Warner, May 1972) alongside tracks by Hannagan, Tamam Shud and G. Wayne Thomas. In mid-1972 Ron Tudor and Brian set up Fable's new imprint Bootleg, which was launched in September. Brian had been inspired by the example of Leon Russell's Shelter label, and the way that pianist-producer-arranger Russell (a former member of crack L.A. session team The Wrecking Crew) had organised a group of regular players around him for projects like Joe Cocker's Mad Dogs & Englishmen. In similar wise, Brian envisagedputting together a regular Bootleg "house band" to back himself and all the other artists on the label, who he would also produce, for recording and touring. At the time, this included singer/songwriter Stephen Foster, jazz vocalist Kerrie Biddell, and the harmony rock group Mississippi. Thanks to the window of opportunity opened by the 1970 Radio Ban, Fable had become the most successful independent record label in the history of Australian popular music, releasing a string of highly successful singles in 1970-71 including "Knock, Knock, Who's There?" which became one of the Australian biggest hits of the year and earned singer Liv Maessen the the first gold record ever awarded to an Australian female artist. Over the next few years Brian's recordings and productions continued that success, earning many gold and platinum records as a solo artist and an swag of awards for film scores, title songs and TV themes, produced many other acts and wrote and produced some of Australia's most successful advertising music. Brian's debut solo single "Ginger Man" established him as a major solo artist. It was a significant chart success, reaching #16 nationally on its release in October 1972 and charting for 18 weeks. His self-titled debut album reached #2, and spent 20 weeks on the album charts. Brian also won the composer's section of the final 1972 Hoadley's National Battle of the Sounds with one of the songs from the LP, "Don't You Know It's Magic". He performed it at the Tokyo World Popular Song Festival, where he won the 'Most Outstanding Composition' award, and John Farnham recorded his own successful version in 1973. In 1973 Brian began to fulfil his ideas for Bootleg by putting together the Bootleg Family Band, and he sang lead and played keyboards on their infectious version of Loggins & Messina's "Your Mama Don't Dance", which was another major hit that year, reaching #4 and charting for 17 weeks. Brian's second album Parabrahm (March 1973) was a Top Ten hit, peaking at #5 nationally, and spawning a string of successful singles -- "Every Mother's Son", "Silver City Birthday Celebration Day" (July) and "Keep on Rockin'" (October). The next single "Alvin Purple" (November) was of course the theme song from Tim Burstall's feature film of the same name. Brian wrote the score for both Alvin Purple (1973), and its sequel Alvin Rides Again (1975). Bootleg issued the Brian Cadd EP, collecting the four hit A-sides "Ginger Man", "Show Me the Way", "Every Mother's Son" and "Silver City Birthday Celebration Day". There were more hits through 1974 – the Top 20 album Moonshine (#16 in September), and the singles "Class Of '74" (April) (the theme song from the TV series of the same name), Let Go (#14 in September) and Boogie Queen (December). By this time Brian had signed an American distribution deal and both Parabrahm and Moonshine came out on Chelsea Records in the USA. Brian toured the USA with The Bootleg Family Band, and they became the first Australian artists to perform on the American television shows Midnight Special and and Don Kigsubner's Rock Concert. 1975 saw the Australian release of the single "Gimme Good Lovin'" (recorded in the USA) and the compilation The Magic of Brian Cadd. After signing a new deal with the Interfusion label, Brian moved to Los Angeles, and over the next 15 years he worked variously in the U.S., Europe and Australia as an artist and producer as well as writing material for other performers. Interfusion issued Brian's albums White on White and Yesterdaydreams, plus the singles "White On White", "Longest Night" (1976), "Yesterdaydreams" (October 1978), "Skating on Thin Ice" (April 1979) and "Very Very Long Time" (May 1980). As well as his own recordings, Brian's songs have been covered by many prominent acts; probably the most notable the Pointer Sisters version of "Love is Like a Rolling Stone", which was picked as the b-side for their massive worldwide hit "Fire". His songs have also been recoded by Gene Pitney ("Let Go"), Joe Cocker, Ringo Starr, Bonnie Tyler, Yvonne Elliman, Charlie Daniels, Glen Campbell, The Little River Band, The Flying Burrito Brothers, Dobie Gray, Johnny Halliday, Sylvie Vartan, Cilla Black, Trini Lopez, Wayne Newton, Paul Jones and many others. He also returned to soundtracks, scoring the American films Homemovies (1982), Fatal Vision and Vampires At Death Beach (1987), and the last instalment of George Romero's cult zombie trilogy Return of the Living Dead (1988). Mushroom issued a one-off single, "My Baby (Loves To Hurt Me)" in September 1982, and in 1983 Brian returned to Australia for a two-year period where he ran Graffiti Records for the Polygram Group. Brian set up his production company Shameless Productions, then issued an album and two singles, "Land of the Video" (March 1985) and "Still Hurting Me" (June 1985) on the Graffiti label. In 1985 Brian secured the rights to a song called "Turn Up the Beat" and produced it as the first solo single for the young Tina Arena, who was then just beginning her career as a solo artist after her 'Young Talent Time' days. The single did not chart and a planned solo album was scrapped but it formed an important connection -- the composers were the same team who later wrote Tina's international smash hit "Chains". In 1986 Brian composed the theme for the successful Australian TV game show Blind Date, and over the years he has written jingles for many successful advertising campaigns including Tooheys, Fosters, Swan and XXXX beer, QANTAS, Pioneer audio, Eastcoast jeans and Tourism Tasmania. He also composed ID jingles for the radio stations 3XY, 5KA, 2HA, 2BA and 2SM, and in 1989 scored the "Morning Zoo" program on Radio WNEW in New York. In 1992, Brian reunited with his old Axiom buddy Glenn Shorrock to record an album for EMI, which was released early in 1993. They spent much of the next two years touring Australia and South East Asia to support the Blazing Salads album and its three singles, "When It All Comes Down", "De-Emphasize" and a new version of "Little Ray of Sunshine". Their backing band included Rex Goh (guitar; ex-Air Supply, Club Buggery band), Kirk Lorange (guitar, ex-Richard Clapton Band) and Mark Kennedy (drums, ex-Spectrum, Ayers Rock, Marcia Hines Band). The album was subsequently released throughout Europe. In 1991 Brian was invited to join veteran US country-rock band The Flying Burrito Brothers. Although no longer containing any of the original members, the "new" Burritos carried on that classic West Coast country-rock tradition with members John Beland, Gib Guilbeau and Larry Patton; Brian has toured with them for a number of years and he played and sang on the Eye of the Hurricane album (1994) which came out on American label One Way. In 1993 he returned to soundtracks and wrote the score for the very hit Australian film The Heartbreak Kid which launched the career of Alex Dimitriades (and was later spun off into the successful TV series Heartbreak High). Early in 1995 he produced the very first Chinese country album, recorded in Mainland China. The Flying Burrito Brothers issued a new album, Honky Tonkin', in Australia on Cadd's Streetwise label (the US title was Sons of the Golden West) in December 1999 and he toured with them through Australia in January 2000. Now based back in Australia, on the Gold Coast, Brian still performs regularly, and has been active in teaching and lecturing on songwriting, in music publishing and other various aspects of the industry in Australia and the U.S. In 1997, he built the state-of-the-art recording studio Ginger Man Sound on Queensland's Gold Coast. In March 1998 he took over as CEO of The Streetwise Music Group in Brisbane, eventually becoming a co-owner. The company, which is distributed through Warner Music, now has some 20 acts spread over three labels (Streetwise, Stallion and Belly Laugh). Brian is currently the Chairman of the Australian Music Industry Advisory Council and President of the Australian Music Foundation. He has also recently joined the online music education provider musicIT as an international consultant. On the recording front, he issued the album Live at Crown in November 1998 on Stallion Records, and released the compilation, Brian Cadd: The Singles, a comprehensive collection of his classic material, digitally remastered, and including some rare tracks like "Angry Words", Brian's own version of the song he originally wrote for Glenn Shorrock. In 2002, Brian appeared as part of the all-star lineup of the historic and hugely successful "Long Way To The Top" concert tour, and he has continued to tour, record and produce, among his many other activities. In mid-2007 he appeared as a guest on the ABC's popular music quiz show Spicks & Specks. Acknowledgements to the Brian Cadd website for this information. "Such A Lovely Way", "We Can Talk" / "Night Life", "Lovin' Tree"
"Woman You're Breaking Me", "Sorry", "Mad Over You" / "Such A Lovely Way", "Who Do You Love"